Imagi just released a 3 minute sneak preview of the upcoming 3d CGI film Astroboy. The film features the Astroboy as he escapes from being captured of a certain group of robots (or men). The sneak preview shows enough footage to convince me that this movie is worth watching. From design, cgi and not to mention the humor is very engaging and it really makes me more excited. 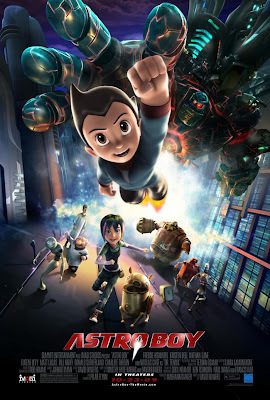 Astro Boy is set to premiere on October 23 in US, featuring the voices of Freddie Highmore, Kristen Bell, Nathan Lane, Eugene Levy, Matt Lucas, Bill Nighy, Donald Sutherland and Nicolas Cage. Directed by David Bowers, and to be distributed by Summit Entertainment.